‘Simply the best,’ sang Tina Turner and sometimes the best meals are those cooked simply with the finest ingredients – very simply! This is what I love about Italian cooking: that the Italians will take two or three ingredients – of the finest quality, of course! – and turn them into something wonderful. No long list of ingredients but just good food cooked with love and care to perfection. Well, I’m not claiming tonight’s meal was Italian – indeed I used some Palestinian za’atar – but it was prepared with great simplicity, a big helping of love and care, and using only top-notch ingredients. I hadn’t intended to buy samphire but as the salmon was being sliced and packaged up for me I spied a large plate of this wonderful vegetable and decided to have some of that too – just a large handful; enough for one, I said. Samphire (or glasswort) is often mistaken for seaweed, but in fact it’s an edible plant that grows in estuaries or tidal creeks. That gives it a wonderful ‘sea’ taste. It looks a little like nobbly fine green beans and has a similar texture, but it has a freshness of flavour that is quite unique and – not surprisingly, given where it grows – is a perfect partner to a fine piece of fish. To prepare it, wash it in a big bowl of water. Give it a good whoosh about and the mud and grit – however clean it looks, it does grow on mudflats – drop to the bottom and then you just need to lift it out. Repeat this another one or two times until there’s only clean water at the bottom. To cook, simply drop it into a big pan of boiling water to which you’ve added just a little salt (it’s naturally quite salty, although the washing will have removed some of that). Then really it just needs to be blanched. 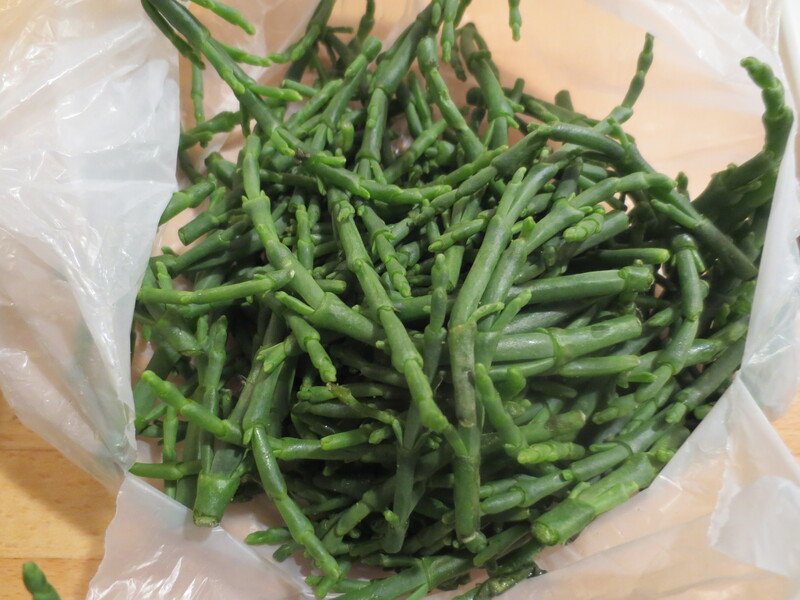 Depending a bit on its thickness – and my samphire were very fine, small pieces – just allow it to cook for a couple of minutes so it retains its glorious green colour but has become a little tender, but retaining a bite. 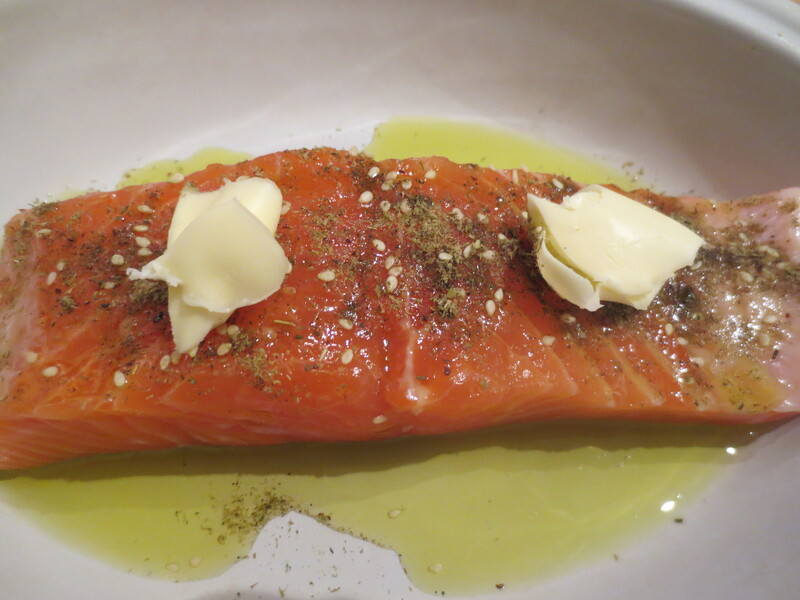 The salmon I simply coated in some olive oil and then sprinkled some za’atar over the top and dotted with a couple of bits of butter. The Palestinian za’atar from Ottolenghi’s I used is a mix of dried thyme, sesame seeds and a little sumac and salt and pepper. I sprinkle it over all kinds of things and love it. I put the salmon into a 200C/180 Fan oven for about 12 minutes. 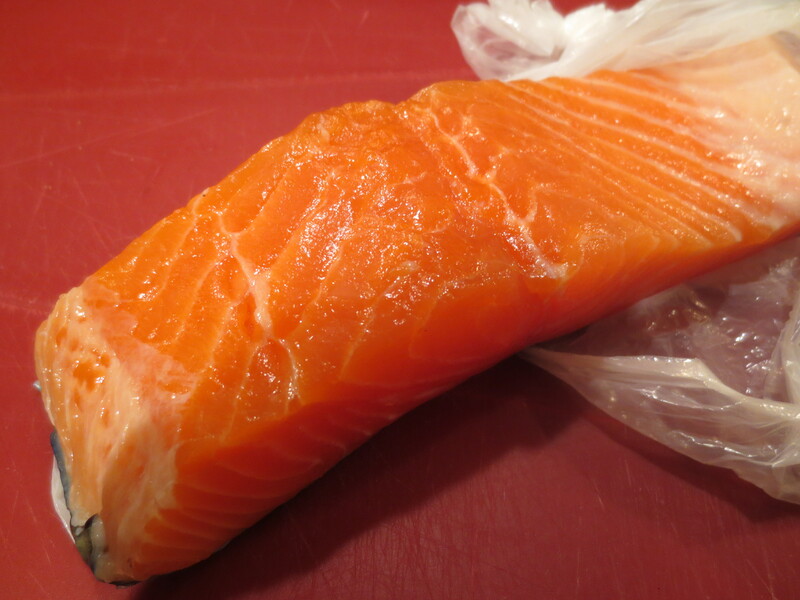 Cooking time will vary according to the size of your piece of salmon but you want it to be slightly rare in the middle so the texture is beautifully moist and soft. The za’atar adds a subtle flavour that works well but doesn’t overwhelm the fish. I cooked the salmon first, having a pan of boiling water ready for the samphire as it came out of the oven and rested for a couple of minutes. Then, once the samphire was ready I transferred them both to a warm plate. I poured the cooking juices over the salmon and dressed the samphire with some extra virgin olive oil and squeeze of fresh lemon juice. 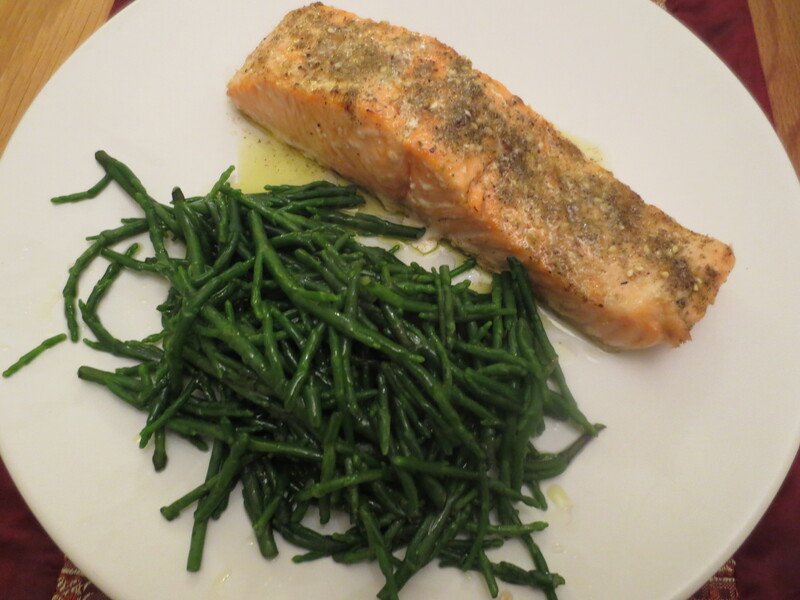 It was a highly nutritious meal: salmon, of course, is a good source of essential fatty acids, but samphire is rich in a wide variety of nutrients, including many vitamins and minerals, such as iodine, iron, calcium and zinc. But above all it was a delicious meal: quite simply the best! What a beautiful slice of salmon! I had never heard of Samphire. It looks delicious with the salmon. Another beautiful meal my dear! Thank you, Judy 🙂 It was a very simple meal made beautiful by the excellent ingredients. Sometimes Nature guides us by colour, don’t you think? Just look at your juxtaposition: pink/coral salmon and gorgeous deep green samphire. Perfect! And I bet it tasted fantastic too, especially as you cooked it with knowledge borne of experience AND experimentation. Did you feel very virtuous afterwards or …? Colours are important in food and cooking, aren’t they? A guide to nutrition too: e.g. carrots really are good for your eyes (being told as kids that carrots help us see in the dark) because red/orange/yellow veg contain lots of beta carotene. No I didn’t feel virtuous 🙂 I don’t eat ‘healthy’ foods in the sense that I eat healthfood-type food. But I do eat healthily because I always cook fresh foods and generally like things to be very simple. So this supper was typical of what I’ll cook myself: a nice piece of fish and some fresh veg. A pretty, healthy and delicious looking meal. Lovely dish. Simple is always best. Your dish is simple, lovely, clean and healthy.